Watts’ abstract, collaged paintings integrate everyday recycled materials, his passion for music, and exploration of his heritage in the modern world. He draws from external influences using emerging forms and juxtaposes varying patterns, cultural references, and numbers in an undefined space. Schimert works in a variety of media, including sculpture, painting, drawing, film, and installation. Her works on paper use overlapping, colorful forms creating a cohesive image. These forms project various emotions piecing together Schimert’s explorations of internal conflict. The selection of work emphasizes their harmonious amalgamation of form, color, and contour. Each artist’s exploration of abstract form exposes emotion with familiar objects stressing their dialogue, where Schimert delineates the subject, Watts compounds it with signs and representations. 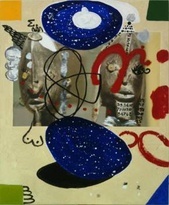 Ouattara Watts has had solo exhibitions at the Hess Art Collection, Maggazzino d’Arte Moderna, Kemper Museum of Contemporary Art, and Gagosian Gallery, among others. His work has also been featured in Documenta 11, the 2002 Whitney Biennial, the 1993 Venice Biennial, New Museum, P.S.1 Contemporary Art Center. Watts currently lives and works in New York.